For many, the Ferrari 488 arguably didn’t warrant the tuning treatment, but that didn’t stop renowned tuner Novitec from extracting a mesmerizing 772-hp from the exotic. If that wasn’t already extreme enough, the tuner has now introduced a new limited N-Largo package for the 488 GTB and Spider, bringing an array of premium upgrades to the fabled supercar inspired by the legendary F40. Compared to the standard cars, the 488 N-largo hardtop and convertible are 14 centimeters wider at the rear axle. At the front, the fenders have been replaced with custom N-largo fenders which add seven centimeters to the width at the front axle, and custom wheel liners house the 21 and 22-inch NF6 wheels developed specifically for the 488 N-Largo using hi-tech forging technology. These custom alloys are wrapped in high-performance 335/25 tires. Not only do these front and rear fender flare modifications give the 488 a more menacing look, they also improve the air flow to the brakes and engine. To help vent the air heated by the brakes from the wheel wells as quickly as possible, three gill-shaped slots were integrated into the top of the front fenders. Larger air vents were incorporated into the rear elements for the engine bay. For improved cooling of the rear brakes, the N-largo rocker panels feature sophisticated air intakes. Custom bumpers and a low-slung front spoiler improve the aerodynamics, and a rear diffuser and large rear airfoil generates additional downforce at high speeds to improve stability. Additionally, sport springs lower the ride height by up to 35 millimeters. An optional Front Lift system on the front axle makes it easier to navigate steep ramps or speed humps. At the press of a button, the hydraulic ride-height adjustment raises the front axle by around 40 millimeters. To match its aggressive appearance, Novitec has tuned the 3.9-liter V8 and is offering two plug-and-play control units which are integrated into the engine electronics. They operate the unit with reprogrammed mapping for injection and ignition, as well as with modified boost pressure control. 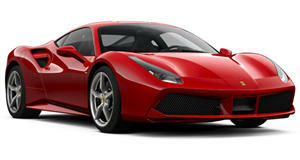 Novitec also installs a high-performance exhaust system “to optimize the performance further while giving the vehicle an even more thrilling exhaust note.” With these modifications, both the 488 GTB and Spider pack 102 more horsepower than the production models, resulting in an impressive 772-hp and 658 lb-ft of torque. 0-62 mph now only takes 2.8 seconds, while top speed increases to 213 mph.